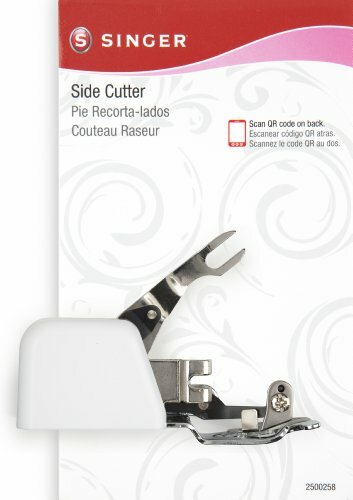 The SINGER side cutter attachment trims fabric while you sew a seam. Sew seams and seam finishes simultaneously. The SINGER side cutter attachment gives garments a professional finish. Just use the ZigZag or overedge stitch to complete your look! It is a genuine SINGER accessory in carded blister pack. For use with low-shank sewing machines. Curvy Series - 8763, 8770, 8780, 5625 Stylist II, 8768 Heritage, 2009 Athena, Singer One & One Plus, 160 Anniversary Machine, 70 Jo-Ann Fabric Anniversary Machine, Confidence 7400 Series including 7467S Confidence Stylist, 7469 Confidence, 7469Q Confidence Quilter, 7470, 7256 Fashion Mate, 7258 Stylist, 7285Q Patchwork, S800 Fashionista. SINGER SEW MACHINE SIDE CUTTER: The Side Cutter Attachment trims fabric while you sew a seam. Sew seams and seam finishes simultaneously. SIDE CUTTER with DIMENSIONS: The Side cutter dimension with 3 x 2 x 1 inches and Item weight 3.52 ounces. ZIGZAC and OVEREDGE STITCH: The Side Cutter gives garments a professional finish. Just use the ZigZag or Overedge Stitch to complete your look. SINGER INSTALLATION: Downloadable instructions and video tutorial available on this product page. View More In Sewing Machine Parts & Accessories. If you have any questions about this product by SINGER, contact us by completing and submitting the form below. If you are looking for a specif part number, please include it with your message. Distinctive 1-4", 1-8" and 3-16" Large Piping/Welting Sewing Foot Package - Fits All Low Shank Singer, Brother, Babylock, Janome, Kenmore, White, New Home, Simplicity, Elna and More!